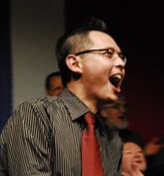 Kenneth Teoh is an experienced artistic director, musical director and workshop leader with a passion for inspiring the community to create music. He moved to Canberra, Australia from Penang, Malaysia in 1994 and has called the nation’s capital home ever since. Ken studied classical piano for 14 years starting at the tender age of 3 and started singing soon after. He also plays numerous other instruments and recently started studying the cello with David Pereira, one of Australia’s most accomplished cellists. Ken’s interest in conducting was sparked at the age of 11, when he led his school band to victory at the Pesta Muzik competition in Malaysia, in which he received high commendations from the adjudicators. He has since conducted many choirs, bands and orchestras of various types and sizes. These days, Ken devotes most of his time to community music, sharing his passion for music with people from all walks of life, mainly through his work with school and community choirs. His ‘office’ ranges from concert halls to street corners, school gyms to convention centres, and foreign embassies to prisons. He has held the positions of Artistic Director and Musical Director of numerous Canberra choirs including the Canberra Men's Choir, the Canberra Gay & Lebsian Qwire, the Canberra Boys Choir, the Strange Weather Gospel Choir, the Burton & Garran Singers and the Canberra Youth Choir. Through running workshops and freelance conducting, Ken has worked with many other school and community choirs within Canberra, around Australia and internationally. Ken was also the musical director of numerous large scale projects including more notably, the Beijing Olympic Torch Relay celebrations involving approximately 550 musicians and the “Australian Carols Spectacular” involving over 300 musicians, where he successfully brought together and combined the talents of professional and community musicians. In 2014, he was invited to be the Associate Musical Director of the Commonwealth Games in Glasgow. Ken is also a prolific arranger of choral music. His arrangements have been performed by many choirs in Australia and overseas. He has sat on numerous music advisory panels including the Canberra Youth Music Artistic Review Panel and the ACT government’s arts funding assessment panel. Ken’s love of people, boundless energy and unique approach to music-making, have ensured that he is kept busy with teaching and conducting engagements in Canberra, around Australia and overseas.